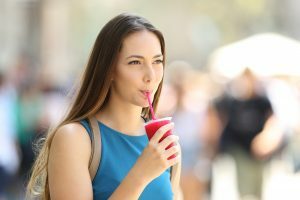 Drinking through a straw can offer some significant benefits if you are in need of them. Always thought that straws were for kids and haven’t thought about this accessory for quite some time? You may be surprised to learn that they can be advantageous for your oral health and smile and may even be just what you require! When you take a sip out of a cup or glass, the beverage you’re consuming saturates all of your teeth. If it’s a particularly pigmented drink, then over time, this can guide your teeth toward discoloration. You do not want this, of course! If you’re looking for ways to limit staining, you may wish to consider drinking through a straw. You can more easily bypass contact with teeth as you swallow the beverage. The same idea applies here. However, in this instance, the concern for your oral health is acid erosion. Perhaps you’re quite a fan of juice, soda, or something else that is acidic and/or sugary in nature. Of course, such drinks encourage acid erosion. Keep them from soaking your teeth by drinking through a straw. When you drink from a glass, you are likely to adjust your jaw to accommodate the glass and incoming liquid. This could backfire if you’re not careful and if you suffer from TMJ disorder. Skip the jaw strain and sip with ease by relying on a straw. It will help protect you from aggravating this oral health disorder. Learn more about how to eat and drink, while protecting your smile health, when we talk with you during dental visits. Get the information and treatment you need in Celina, TX by contacting Celina Family Dentistry to schedule a visit today at (214) 851-0130.